My family LOVES milk! My husband and kids drink it everyday with meals and snacks. When I recently was given the chance to review Over the Moon milk, it automatically put my whole family in a good “moo”-d! What makes Over the Moon milk different from other brands? Over the Moon milk contains 34% more calcium and 37% more protein than regular milk, which is especially important for my active, growing kids. And since I also use milk in my morning smoothies, the extra calcium and protein is perfect for helping to keep my diet in check. Over the Moon comes in three varieties – Fat Free, 1% low fat and Chocolate. I was impressed to see that their Chocolate milk contains 45% more calcium and 37% more protein per serving than regular reduced fat chocolate milks; it also contains no high fructose corn syrup. We chose to try out the 1% Lowfat white milk since that is what our family prefers. We all agreed that Over the Moon milk tastes richer and creamier than our usual brand of 1% milk. It was so delicious that it tasted more like whole milk. It was smooth and satifying – and enjoyed by the entire family. 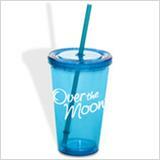 Over the Moon is giving away three Sipper Cups to three lucky Delco Deal Diva readers! These sippy cups are great for keeping drinks cold while at home or on-the-go! Disclosure: I was given a stipend to purchase Over The Moon milk for review. All opinions are my own. I love Over the Moon! My kids love over the moon in chocolate! Is it insulated? Is it one of those cups that had liquid in it that you freeze? Thanks for the chance! I’d like to try this milk! These are great cups for kids! Thanks for the giveaway!